With San Diego's awesome weather and spectacular scenery, it's no wonder locals are also big dog lovers. With so much to do outdoors, it only makes sense to have a canine companion alongside when you’re out and about, either walking through the neighborhood or strolling along the boardwalk or stopping at a coffeehouse. But dogs also need a place where they can let go and romp around and be, well, dogs. Luckily, San Diego has a variety of off-leash dog parks. San Diego has some specifically designated outdoor spots to take your dog to socialize with others of their ilk and do whatever dogs love to do: you know, sniff, bark, growl, chase, pant, and, uh, mark. Here’s a rundown of some of the more popular doggie-friendly designated dog off-leash areas around San Diego County. And remember to adhere to each area’s rules and regulations, which may differ. This northeast San Diego off-leash dog park is located at 18448 West Bernardo Drive in Rancho Bernardo. The 2.5-acre park offers leash-free space adjacent to Rancho Bernardo Community Park, and includes additional parking for dog park users. This 1.4 acre spread within El Cajon's Wells Park is the East County's second leashless dog park and is a grassy haven for pooches. It has gravel and grassy sun areas and dual drinking fountains (for pets and their owners). Located in the southwest part of Wells Park at 1153 E. Madison Avenue, the off-leash area is open daily from 7 a.m. to 9 p.m. and is lighted for night use. 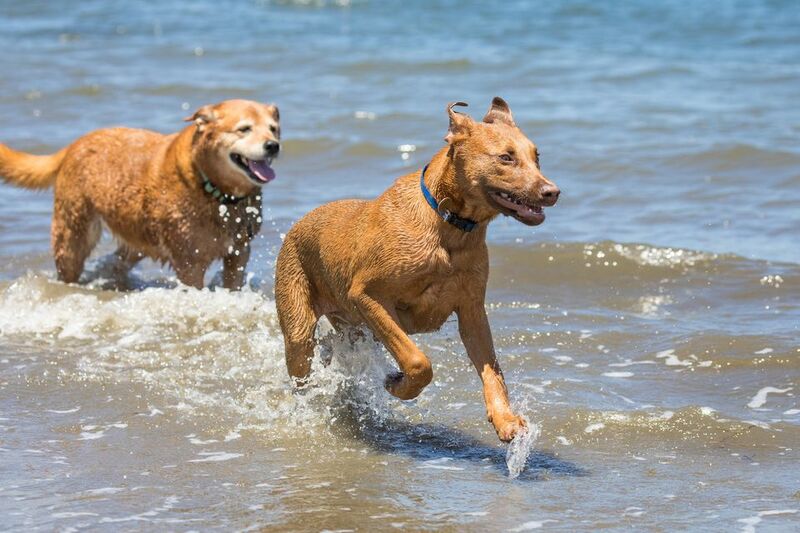 Located in northern Ocean Beach, Dog Beach is the original beach spot to take your pooch in San Diego and remains popular. This beach area is located at the west end of the San Diego River Floodway, also known as the Ocean Beach Flood Control Channel. With a wide swath of sand and the Pacific surf to roll in, Dog Beach is a special place to bring your mutt, or just to come and watch dogs be dogs in the surf and sand. Open 24 hours. Most of this large sandy island in Mission Bay is designated leash-free for dogs. It has lots of sandy dunes to romp in, and the calm bay waters lets the more adventurous dogs take a quick dip. Open 24 hours. This is an enjoyable setting for dogs and owners alike. A large grassy lawn in the middle of Balboa Park is the perfect place to play catch with balls and frisbees, and to socialize – both for the dogs and their owners. Located along Balboa Drive at El Prado, on the south side of the Cabrillo Bridge. Open 24 hours. Morley Field is located on the east side of Balboa Park, northwest of the tennis courts. This off-leash dog spot is ideal for residents of nearby North Park. Located in the picturesque city of Coronado, the dog beach in Coronado is at the most northern end of the beach next to the Naval Air Station. Wide and sandy, with the Pacific surf and the Hotel del Coronado in the background, Coronado’s dog beach is a nice getaway. Located on Ocean Boulevard near Sunset Park. Poway Dog Park is an award-winning 1.75 acre fenced-in, lighted, off-leash area for dogs within the City of Poway's Community Park. Poway Community Park is open from sunrise to sunset daily. Lights in the dog park off-leash area extend evening hours to 9:30 p.m. Located at 13094 Bowron Road in Poway. A nice, low key spit of sand to let your dog roam in lovely Del Mar, but with limitations: the off-leash designation is seasonal only, so bring your dog without its leash only from September to June. Parking is also at a premium and you may have to pay for street or lot parking. Located along Camino del Mar in Del Mar. This large, pleasant neighborhood park in the La Mesa suburb of San Diego has a designated acre for off-leash dogs. Located at 9550 Milden Street in La Mesa.